Dart are a fun fishing target that will test the skills of even experienced beach fishermen, and the surprisingly good yield of tasty flesh from these narrow bodied fish is just a bonus. 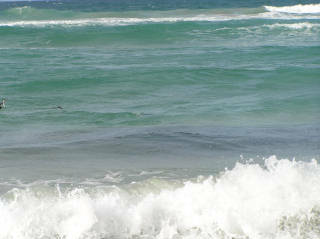 Dart frequent turbulent areas of the surf zone and ocean rocks picking up morsels of wave smashed shellfish, baitfish and crustaceans exposed by the elements. Due to the dangerous conditions that accompany fishing for them around ocean rocks I won't suggest nor cover those methods, but concetrate on beach fishing methodology. Dart love deep gutters with narrow white water covered banks with its inner face, producing a milky green colouration washing machine like turbulance. Areas like this are highly recommended if targeting dart but at times when schools of small bait fish such as anchovies make an appearence they can be found in unusually shallow areas. Another consistent area are small but deep gutters edging flats and spits which hold good quantities of beach worms or pippis where the shifting sands expose these tasty mouthfuls. Tackle requirements for dart should be longer rods built for casting good distances to wide banks matched with lines from 2 to 6kg, I personally opt for 6 kg mono as it causes a lot less damage to fingers when using Alvey reels and if a trophy fish happens along gives a better chance of landing it. Mainline traces of 30cm to better than 1 metre will suffice and is usually a matter of personal preference. Sinker choice should be more tuned more to maximising your casting distance rather to anchor you bait in one spot. While a stationary is fine a moving bait worked by walking the beach with the washed along tackle can be very effective especially when bites are slow. Hook types and sizes should suit the bait being used with no4 to no1 long shanks being ideal for yabbies or worms and up to 1/0 bait keeper hooks baited with large pippis. Some may consider a 1/0 hook far to big for a fish with such a small mouth but I can tell you from personal experience that even runt dart have no problem what so ever inhaling hooks of this size and larger. Gangs of 2 x no2 hooks baited with white pilchards or anchovies can also be enthusiastically attacked on their days. When casting for dart be prepared to close your bail arm or turn your sidecast back into position as soon as the bait hits the water. When actively feeding dart will hit a bait almost immeadiately it hits the water and those that are too slow will end being bust off as loose line wraps and catches around the reel. Their is a lot of variation to a dart bite patern, with the primary take being a short pull back on the line. Others include lifting the bait allowing slack in the line not dissimilar to a wave picking up the line and washing it in, others are smashes where the bite cannot be confused as the rod bends heavilly under the fishes full weight and power leaving no doubt in your mind that you are on. Then there are the very soft tap tap bites which bare no relation to the size of the fish, the list goes on, but your best idea is to remain alert and use every sense avialable from sight to touch just waiting for variation to what is normal. You will soon become attuned to the conditions you are fishing and start to realise that little pull down on the tip of the rod as each wave crest slides around your line just happened again but this time there wasn't wave passing. A strike in this case will almost certainly result in a hookup, no movement will result in a baited hook when retrieved. In order to pick up these tiny nuances you must maintain constant positive contact with your line, allowing slack in your fishing line will guarantee a lot of missed fish. Don't be gentle with dart on the strike, hit them like a tailor. When using monofiliment lines, the length of line out combined with the resultant stretch will cushion the impact even on their soft mouths. Casts into the white water of the banks produced several plump healthy dart that had been feasting on the small fish. Most had up to a dozen of these 7cm long bait fish in their bellies, with one disgorging a number of them on capture. As we previously mentioned swallowtail dart are a small trevally species attaining a maximum weight of a little over one kilogram and length of approximately 60 cm. 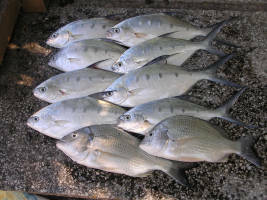 When fishing however most specimens encountered will be half that weight and be around 40 cm or smaller. Tide stages don't have a huge bearing on dart, to me it is more the quality of the gutter that impacts them. If a beach has good low water formations then fishing the last few hours of the run out and hour or two of the run in should yeild results. Likewise if you only have uninteresting shallow low water gutters then come back a few hours before high tide and fish what should now be much better spots. Either that or find a shallow enough gutter to wade out onto the bank and cast out to the next bank. Lastly don't spend too much time fishing for dart in one gutter, three casts or 10 to 15 minutes should indicate whether dart are present. If you have not had a bite in that time move on to the next likely spot to you find where they are feeding.